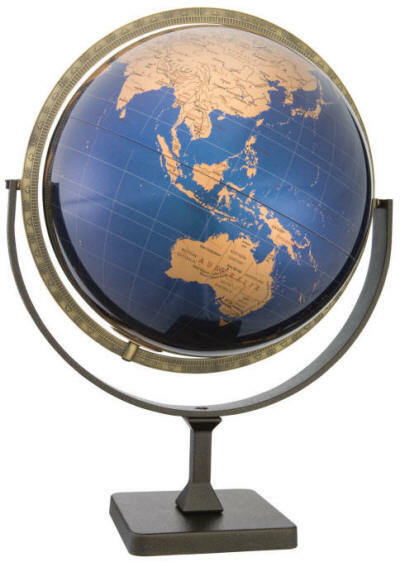 Tallinn world globe, named for the capital city of Estonia, Europe, is a new desktop model from the reputable Replogle Globes company. A sleek finish lends an air of modern opulence to the crisp metallic blue and gold of the Tallinn globe ball, while the textured pewter-finish base and full brass meridian offer classical contrast. The meridian (ring supporting the globe) allows the ball to be turned 360° for easy access to all geographical points of interest from any possible angle. The fully up-to-date globe revolves within the meridian (East/West), and the meridian swings (North/South) within the arch on top of the base.